FIMS Associate Professor Sharon Sliwinski stumbled across one of Nelson Mandela’s dreams by accident. She bought his autobiography – back on shelves just after his death – while stuck at an airport and read it on a long flight. “I still vividly remember coming across the passage in which he describes a recurring nightmare that he had while he was imprisoned on Robben Island,” Sliwinski says. In his dream, Mandela had just been released from prison, only it was not Robben Island, but a jail in Johannesburg. He walked outside the gates into the city and found no one around to greet him – in fact, there was nobody around at all. Mandela walked for hours and headed toward his home, only to find an empty ghost house, with all the doors and windows open but no one there at all. After spending years studying some of the worst moments in human history, Sliwinski became intrigued by people’s capacity for psychological resilience. “What enables people to survive dark times? What is courage and cunning made from? I still don’t have good answers to those questions, but I did begin to notice the dreams: people who survive dark times often report having been visited by a significant dream, or actually, more often, a nightmare. You can find this throughout human history, all over the world,” she says. 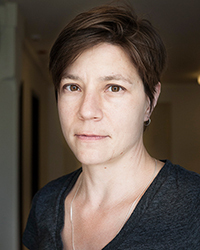 In November 2015, as part of the 2015-16 FIMS #PublicInterest lecture series, Sliwinski presented her research in a talk titled “Dreaming in Dark Times,” which explored the way dream-life can be understood both as a private experience and social text, drawing on Mandela’s recurring nightmares. In December 2015, Sliwinski received an internal research grant as start-up funding for her Museum of Dream project – a virtual museum whose “collections” will include dream reports taken from the historical record. “In my experience, dreams are rather difficult objects to find,” she says, “so the goal here is to make to make a searchable index of historical dreams. For example, First World War poet Wilfred Owen documents a recurring nightmare in one of his famous poems, “Dulce et Decorum Est.” The Museum will index such dreams and include a virtual link to the “object”; in the case of Owen’s poem, a manuscript held by the University of Oxford’s English department.